You'll find hundreds of uses for this versatile, environmentally friendly cleaner. Dilute as needed to remove oil, grease, ink, and paint from washable surfaces, including parts, palettes, and printing plates. Biodegradable, nontoxic, nonabrasive, non-ionic, and nonflammable. 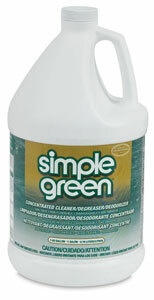 ® Simple Green is a registered trademark.